Woodland Hills Medical Supply provides devices and supplements that are shipped throughout the country. Our specialty is providing devices for topical sinus therapy. We are a U.S. distributor of the RhinoClear Sprint atomizer, which is manufactured by Flaem Nouva in Italy. We partner with Woodland Hills Pharmacy in California to provide devices and supplements that complement their wide range of compounded formulations. 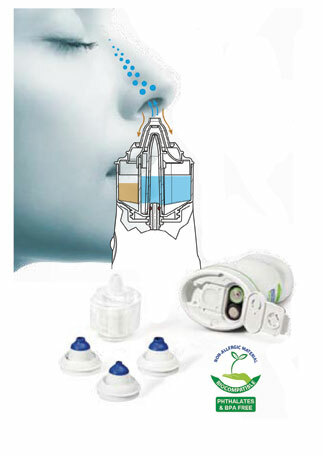 Fast and comfortable to use, the RhinoClear Sprint atomizer allows for daily irrigation and cleansing of the nasal passages. It can be used with saline solution or medications as recommended by a physician for proper irrigation and treatment of the nasal passages – removing secretions, dust and harmful substances accumulated in the paranasal sinuses. The atomization chamber can be easily removed for proper cleaning and replaced to allow full customization of the unit for each member of the family. The soft touch tip nasal adaptors come in three different sizes for a more custom fit and can be stored in the special storage compartment housed in the front part of the charger base. The RhinoClear Sprint is the latest model of atomizer following the popular NasaTouch. While the NasaTouch is no longer manufactured, the RhinoClear is the same atomizer – just battery powered. Our customers find this latest model to be more convenient and portable while still having all of the same benefits as the NasaTouch atomizer.